The state Democratic Party has been moving rapidly to the left—and because it has a supermajority, that portends big social reforms. Last weekend, the nearly 3,000 delegates to California’s state Democratic Party convention chose their new party leadership. John Burton, the legendarily foul-mouthed, fiercely progressive, larger-than-life figure who has, both in the legislature and as party chair, put his stamp on the state Democratic apparatus for close to half a century, was finally stepping down. Eric Bauman—a party insider from Los Angeles, a one-time trauma-center nurse, gay, connected, with a dramatic persona and a powerful baritone voice—and Kimberly Ellis, an insurgent, Bernie Sanders–inspired African-American activist who had traveled the state with a take-no-prisoners, make-no-compromises message, were vying to fill his rather oversized boots. Ellis’s supporters, many of them nurses brought in by the increasingly assertive California Nurses Association (CNA), were the more vocal. They flooded Hall A, in the Sacramento convention center, wearing pink “Unbought, Unbossed, Kimberly Ellis” T-shirts, waving her placards, and standing to chant her name again and again as the time neared for her speech late Saturday afternoon. Policies that even a year ago were considered wildly utopian are now mainstream in this state. It was a powerful speech, but in the end it wasn’t quite enough. 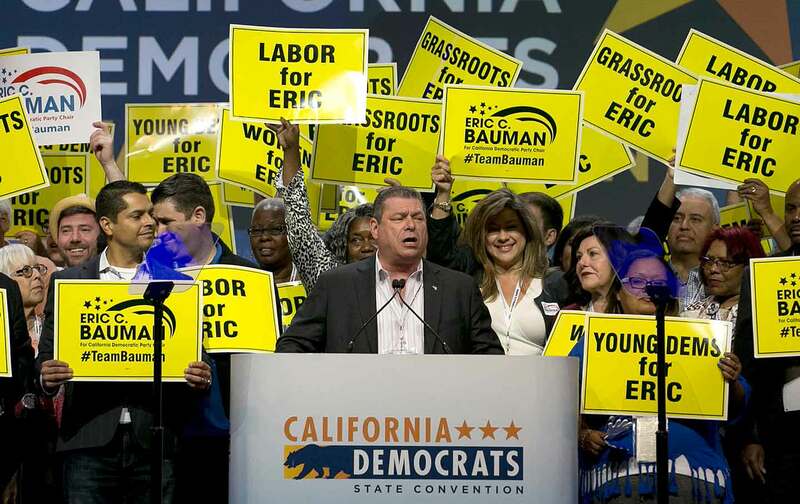 Ellis—who had turned what was long thought to be a shoo-in for Bauman, the longtime chair of the LA County party, into a competitive race—lost by a whisker. When the votes were tabulated late Saturday night, as the delegates were making the rounds of the various parties dotted around the Capitol building, Bauman came in with 1,493, Ellis with 1,431. Ellis refused to concede, though, claiming—without showing proof—that there were irregularities in the voting process. As of this writing, Bauman is the incoming chair, yet it is still possible that lawyers will be brought in by Ellis to challenge the result. In many ways, however, the outcome of the vote for party chair was less important than the underlying message of the convention. Whether Ellis won or lost, the California Democratic Party has, since the general election, been moving rapidly leftward, has been “Bernifying” itself—and, because Democrats have a supermajority in the state legislature, in all likelihood that portends a huge progressive push for big-picture social reforms over the coming years. Policies that even a year ago were considered wildly utopian are now—as the federal government veers dangerously rightward—mainstream in this state. Support for the legislature’s single-payer bill is now something of a litmus test among grassroots Democrats. All of the leading contenders to replace Governor Brown when his terms ends in 2018 are now on record as favoring a move toward universal, or single-payer, health care in the state. In fact, support for SB 562, the single-payer bill currently being pushed by State Senators Ricardo Lara and Toni Atkins and ardently supported by Ellis and the CNA, is now becoming something of a litmus test among the grassroots for Democratic politicians. The party’s Assembly and Senate leaders are pushing some of the world’s most assertive environmental and clean-energy policies—and are increasingly looked to by people around the world as the last, best hope to keep the United States on track to meet the commitments agreed to by Barack Obama at the December 2015 climate summit in Paris. Big-city Democratic mayors are solidly in favor of defending their sanctuary-city policies, and Attorney General Xavier Becerra is busy putting up as many legal challenges as he can to Trump’s political priorities. There’s a confidence to California Democrats’ language these days that, on the surface, is surprising, given who is in control in Washington, especially since President Trump and Attorney General Jeff Sessions have made no secret of their desire to punish California for its opposition to their policies. In fact, an assertive California could well become by far the most important state in the country politically over the coming years: Its junior senator, Kamala Harris, is already being talked about as a plausible presidential candidate come 2020, and she is tailoring her message these days to one of vast outrage. “We are facing a series of fundamental fights over fundamental rights,” she told her Sacramento audience. “I come to you, bloody knuckles, after these first 120 days. And I come to you ready to keep up the fight.” One of the state’s congressmen, Adam Schiff—who was the keynote speaker at the convention’s Saturday-night dinner—is the lead Democrat on the House Intelligence Committee, which is investigating the Trump-Russia connections. The national Democratic Party knows that if it is to retake the House in 2018, all roads lead through California, where more than half a dozen Republican Congressmen (the state has 14 Republican members of Congress in total) are considered vulnerable because of their support for Speaker Paul Ryan’s deeply unpopular health-care bill. And, if the party does reclaim a majority in the House next year, Nancy Pelosi, from San Francisco, will likely once again become House Speaker. Completing the picture, Democrats in the California legislature will likely soon push legislation to move the state’s primary way up the calendar in 2020 (it has long been held in June), making it not just an afterthought in the primary process but a key player in winnowing the field and shaping candidates’ political messages, right up there with Iowa and New Hampshire. Since the election, with remarkable rapidity California has increasingly come to see itself not simply as the largest in population of the 50 states, but as what I call a “state-nation”—a part of the federal system, but with a unique, and powerful, role to play in the Trump era, a role psychologically and politically and morally larger than that ordinarily played by a state, even a big and prosperous one like California, in a federal system. The state, which only a few years ago was seen as a governing catastrophe—unable to balance its budget, with an out-of-control prison system and an inability to tax itself enough to provide basic public services—has in the past few electoral cycles dramatically reinvented itself. Coalitions of labor, young voters, new citizens, high-techies, and environmentalists are reinventing the majority-minority state’s politics, pushing it toward a wholesale embrace of progressive themes at an extraordinarily rapid pace. California is self-consciously fashioning itself as a moral seed-bank, a place in which the best parts of the American Dream, of the aspirational and moral and transformative language of American society, can be protected, and where science can be nurtured, at a time when the presidency is controlled by a man more interested in “transactional” relationships than in universal moral values, and in short-term profit rather than the long-term well-being of the planet. The Golden State’s political leaders compete with one another to fashion themselves as leaders of a vast and powerful resistance to Trump administration policies. Increasingly, they talk about the fact that the state is the sixth-largest economy in the world and now has the political muscle to push an agenda drastically different from Trump’s on health care, immigration, the environment, the border, race relations, LGBTQ rights, labor policies, affordable housing, education, and a raft of other issues. Gavin Newsom, former mayor of San Francisco and currently the state’s lieutenant governor, is arguably the leading contender to replace Brown as governor in next year’s election (other candidates include State Treasurer John Chiang as well as former Los Angeles Mayor Antonio Villaraigosa). Newsom wants to create a state bank in California that can serve as a massive engine for infrastructure investment. He also talks about the possibility of California, a so-called “donor state,” working out ways to put the tax money it owes to the federal government into an escrow account if Trump’s people try to make good on their threats to withhold federal dollars in response to the state’s standing firm on sanctuary for undocumented immigrants. Standing across L Street from the great domed Capitol at the late-night Young Democrats street party, after the serious business of the convention had concluded, Newsom talked about the need for not just opposition but active resistance. A tall man with an easy smile, who wears his hair slicked back like a character in Grease, he is reveling these days in the language of rebellion. “You can roll over and try to get along, or stand tall and push back. My approach with a bully is you’ve got to stand tall and push back.” Newsom envisions that, over the coming years, California will be able to marshal ongoing regional resistance, “aligning like-minded governors and legislators throughout the West.” He talks about the possibility of California using its huge economy to create a workable single-payer health-care system, and of Oregon, Washington, maybe even states back East buying in. “The West Coast stands in stark contrast to what’s coming out of Washington, DC,” he avers.